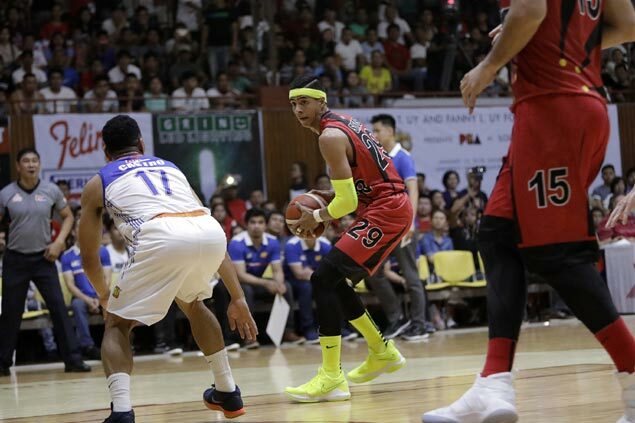 SAN Miguel Beer came alive when it mattered as it turned back TNT KaTropa, 88-76, at the San Agustin gym in Iloilo on Saturday to sustain its unbeaten run in the PBA Philippine Cup. The defending champion Beermen overhauled an early deficit, before turning to Arwind Santos and Alex Cabagnot who led a late salvo for the Beermen to pull away to their third straight victory. Santos scored seven of his 15 points inside the last three minutes – on a pull-up jumper that put an end to the Texters’ rally, a triple that proved to be the dagger, and the exclamation slam dunk as the Beermen remained the only unbeaten in the league. The Beermen also handed the Texters their second loss in three games, snapping their six-game road losing streak against TNT in the process. June Mar Fajardo led the Beermen with 20 points on 8-of-11 shooting, six rebounds, three blocks, and one steal in almost 35 minutes, while Santos added 11 boards, four blocks one assist, and one steal in nearly 36 minutes. Cabagnot chipped in a double-double of 11 points and 12 caroms, on top of two assists, and one block in 38 minutes, while Marcio Lassiter was the other SMB player in double-digit scoring with 15 points – despite missing all his five three-point attempts – along with eight boards, three steals, and two assists. Troy Rosario led the Texters with 15 points – the only TNT starter to score in twin digits – and added 13 boards, one assist, one steal, and one block in almost 40 minutes as a starter. The Texters pulled to within two points, 74-76, but Santos retaliated with that pull-up jumper before Cabagnot drained a trey that sparked SMB’s 14-2 run to finish the game.